Join with the BAU to solve two thrilling cases! Hunt for clues in 25 tricky and beautiful Hidden Object Scenes. 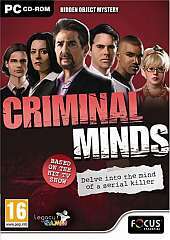 Get closer to the truth as you work with JJ, Hotch, Morgan, Prentiss, Reid, Garcia and Rossi as you interrogate suspects with special Criminal Minds Profiling Mini-games. Use the information you gather from over 40 taunting puzzles and codes to find the criminals as they try and lead you astray. Enjoy 2 immersive cases with stunning locations and nasty criminals.